Shepherd University created a College of Business which opened in fall 2017. It includes Business Administration, Economics and Finance, Accounting, and the MBA program. The University successfully completed this national search by hiring Dr. William “Ben” Martz through resources raised by the Business 2020 Initiative, which was led by Ray Alvarez (above right), Shepherd alumnus and former Shepherd University Foundation President. 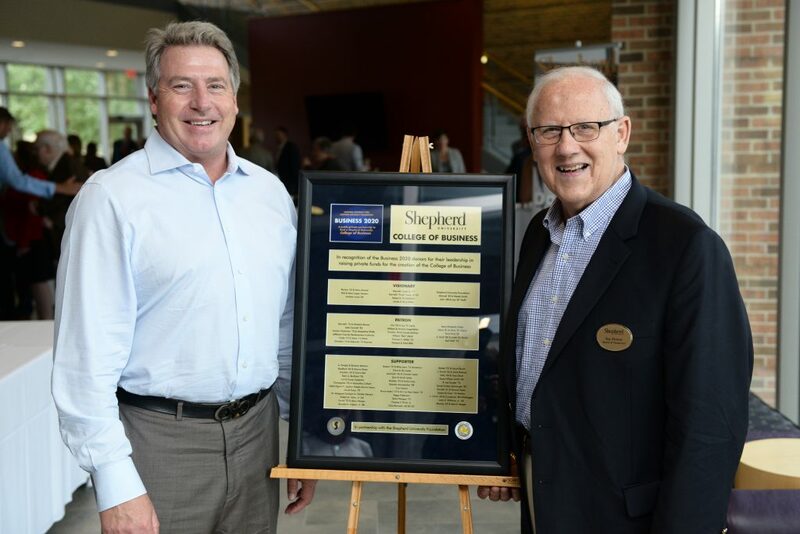 During the committee’s first meeting July 27, 2016, hosted by alumnus Ken Lowe at the Clarion Hotel and Conference Center in Shepherdstown, Mike Smith (above left), former president of the Shepherd University Foundation, offered a $250,000 challenge grant. Smith’s challenge gift is the first at this level for Shepherd. This is an extraordinary example of the commitment of our business community partnering with Shepherd to revitalize an important program and provide significant new opportunities for students.